As your dog ages, it begins to gain weight. Gradually, your senior dog becomes overweight, but it is not their fault. They no longer possess the energy they once had when they were young and jumping all over the place. Your senior dog may be at an unhealthy weight, but you can change that by feeding your pet Canidae Platinum Senior, Overweight dog food. Why Choose Canidae Platinum Senior, Overweight? 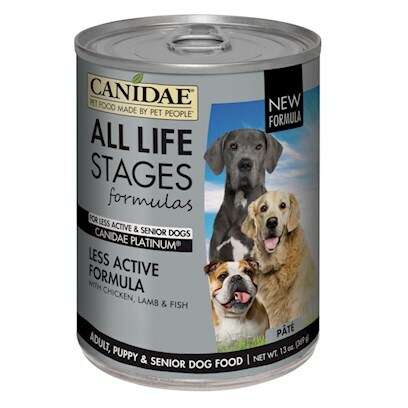 Canidae Platinum Senior, Overweight dog food will benefit your dog senior by helping them receive the necessary protein and nutrition they need to lose the weight and return to a healthy, normal weight. Made with chicken, lamb, and fish cooked in chicken broth, this high quality formula is an ideal solution to help your dog get back on track. The dog food, specially made for senior and overweight dogs, is full of flavor. Your dog will love to chow down to its favorite meal of the day. If you have senior dog that needs to shed weight, put them on a diet they will love, not hate. Give them a bowl of delicious canned dog food and see their transformation take place, transforming into a healthier and fitter version of themselves. The dog food has no reported side effects with the AAFCO Dog Nutrient Profiles certifying it for maintenance. You should feed your senior dog weighing 50 pounds two cups to lose weight and 2 to 2 1/2 cups to maintain the weight loss.